short girl, long island. : Giveaway, Day One: Weekdāzed. CLOSED. Happy December! 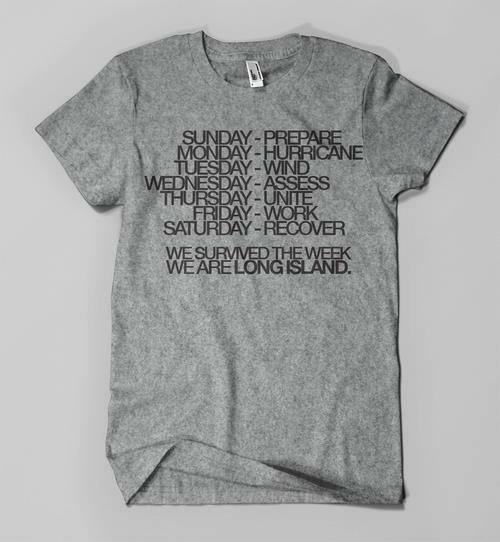 Today kicks off Giveaway a Day December on short girl, long island. The first item to be given away is from Weekdāzed, a Long Island based company created to offer fashionable shirts at affordable prices, that also give back to the community. The shirt being given away today is the Hurricane Relief T.
Many cities + towns on the east coast were ravaged by Hurricane Sandy at the end of October. Granted, a lot of work has been done thus far, but there is still so much left to do to help rebuild. Proceeds are donated to Red Cross, which is awesome. To enter, just check out the Rafflecopter below. Only one entry is mandatory + the rest are optional. Good luck! On an extremely local level I plan on making a gift basket to leave on the doorstep of a local family that I know that is in need. We also donate to Harvesters, the Kansas City food bank. What a great gift. Sandy really knocked us for a loop. this year my mom asked me not to get her any gifts; she just asked if I could adopt a family and get them presents instead. so my plan is to spoil that family rotten!